Do you have a checklist for ensuring your guests’ comfort? There are many things we do to prepare for Thanksgiving, from planning the menu to setting the table, and arranging the flowers to setting the right mood. The effort we put in is geared to celebrating our gratitude, as well as making our guests feel at home. With that in mind, the one room we should take care to not overlook is the powder room. *this post contains some affiliate links I like to start by adding something seasonal to the room in keeping with the holiday. It extends the festive mood to all parts of the house and lets your guests know that all their comforts were taken into consideration. 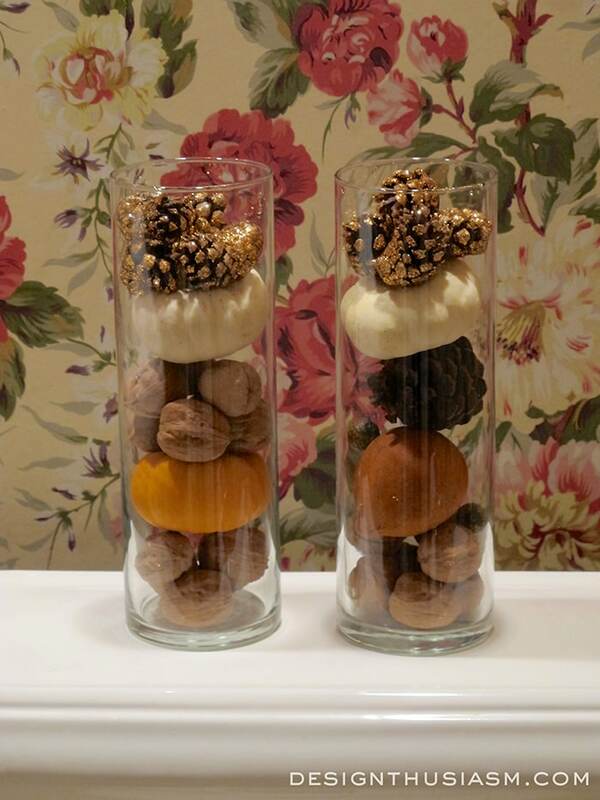 Here I layered some traditional autumn decorations into two tall glass vases, including tiny pumpkins, pinecones and walnuts. I love to add a pretty embroidered vintage guest towel to lend a sense of “special occasion”. 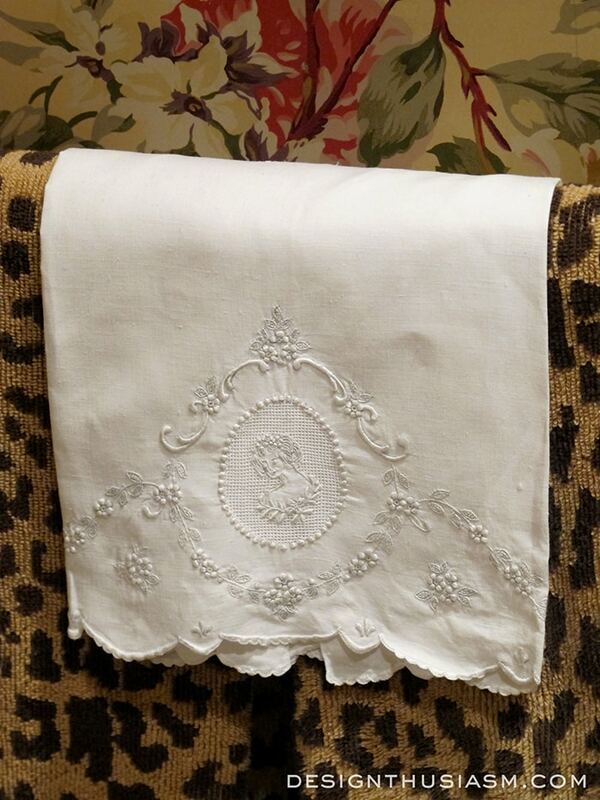 I keep matching leopard paper napkins on a shelf above the sink, as I’ve noticed that no one uses the fabric towels, so I don’t worry about putting out my best vintage pieces. The terry leopard hand towels beneath the vintage tea towels are from Pottery Barn. 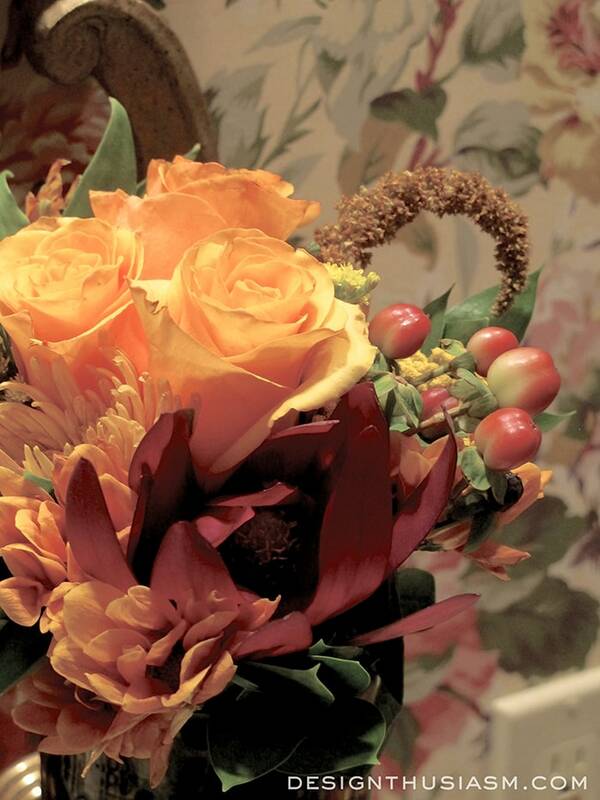 The tones in my powder room fit perfectly with the season, so it’s not very hard to add autumn warmth. The wallpaper is from Ralph Lauren and it adds depth to this most simple of rooms. An absolute must for me is fresh flowers in the bath. This tiny fall bouquet is tucked into my tortoise shell drinking glasses. 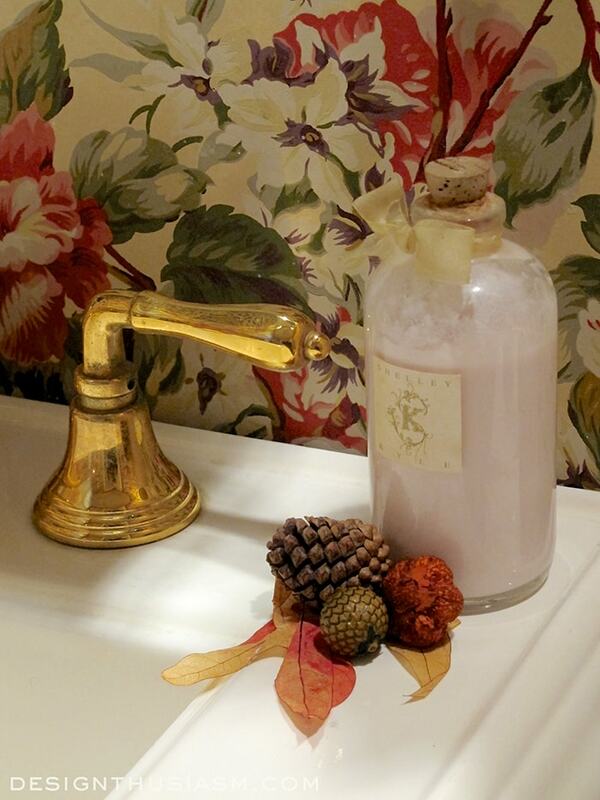 The other must for a powder room is a lovely lit candle. 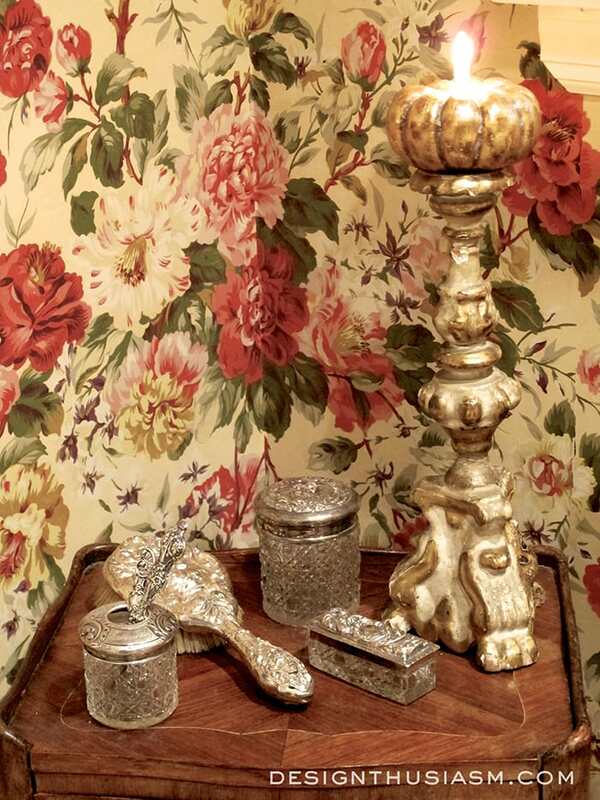 This gilded pumpkin candle is set atop my antique Florentine candlestick. You can see it mixed in with some of my vintage silver pieces that were highlighted in my recent post SHINING THE SILVER FOR THE HOLIDAYS. 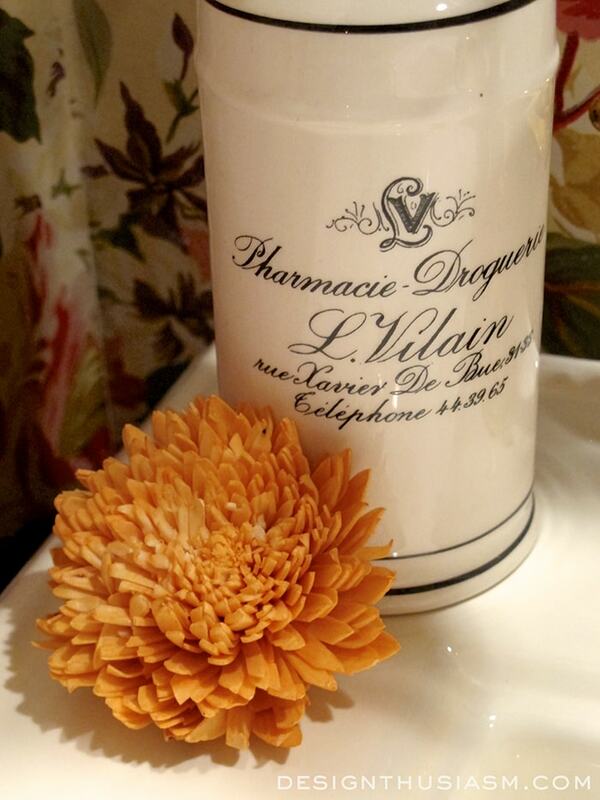 I like to use pump soap for guests to keep things sanitary and I love this French Pharmacie inspired dispenser from Pottery Barn. Guests always appreciate a good mirror to check their appearance as the evening rolls on. I also keep lip balm, bandaids and other comforts in the tiny drawers in the corner table. Tucked under the table is a wicker basket with spare toilet tissue rolls. A gracious hostess always keeps the spares in an obvious spot, so guests never have to interrupt the celebration to ask. I also keep moisturizer out for my guests to use on dry autumn skin. A few fall notes are sprinkled nearby. The powder room is a spot one visits for a very brief few moments, but it should always carry on the festive and special tone you’ve set in your entire house. Thinking ahead and ensuring you’ve tended to your guests’ comforts is a way to let them know you enjoy their company and you are delighted to welcome them into your home for the holidays. Linking with Thrifty Decor Chick, YourDesignsThisTime, BNOTP, Inspire Me Tuesday, Coastal Charm Tuesday, The Scoop, Twirl and Take a Bow, Knick of Time Tuesday, Wow Us Wednesdays, Home and Garden Thursday, Beyond The Picket Fence Vintage, From My Front Porch to Yours, Jan Olson Thursday, Feathered Nest Friday, Show and Tell Friday, Shabby Nest Frugal Friday, Funky Junk Interiors, Best of the Weekend Party, Thoughts from Alice Sundays, Silver Pennies Sundays. I so agree with you about the paper napkins. I find that my guests prefer them! I’ve also been using liquid soap in a pump dispenser, but I miss a “real” bar of beautiful, creamy soap. I keep going back and forth on that one. A few years ago we worked on the bones of our powder room, and installed a nice ceramic tile on the floor, got a lovely new vanity, and Kohler faucets with the porcelain caps that read “Hot” and “Cold” in a French Script. And then I stopped! It’s as though I ran out of ideas! The Powder Room is functional, but it has a serious case of the blahs. Your post has reminded me that I have to work on it a little more. A little shelf like yours might be a start . . . Thank you for all your beautiful ideas. Thanks for visiting, Maria! The paper towel thing is the funniest thing. Actually, I notice the same thing with linen napkins at the table. I always use cloth napkins and most of the time at least half the guests don’t take the napkin out of the napkin ring. It’s so funny. I actually feel bad because then it’s like I’m not providing them with napkins. But I would never put them on the table if I didn’t expect for them to be used… lol! So pretty~ how nice to have a drawer full of necessities for your guests! Thanks, Jenna! Well, they are *very tiny* drawers… lol. But I can fit bandaids, tampons, aspirin (have to lay the bottle down sideways), lip balm and a few other things. A lovely reminder to check on my powder room and make sure it is “guest-ready”. You have added not just the necessities, but also the niceties, too! I will add that you want to make sure you at least have a plunger in the house. I had a young guest get over-zealous with toilet paper at a party, only to realize that my daughter had “borrowed” my plunger and taken it to her home! Oops! Thanks, Chloe! I love the way you put that – about the niceties… 🙂 And yes, I actually moved the plunger that generally sits in the corner in order to take the photos… lol! Your little powder room is a jewel! 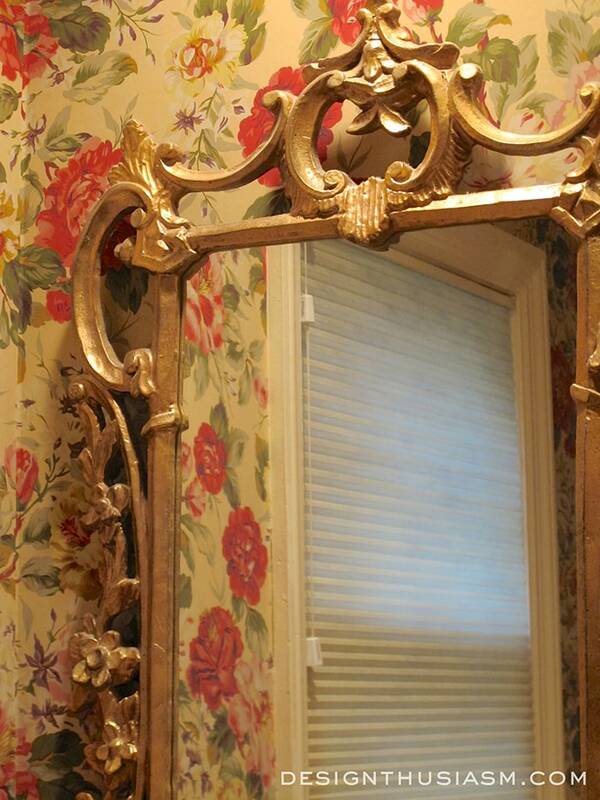 I love the wallpaper and the brass finishes. Love that you mixed leopard with that wallpaper. We have a full bathroom downstairs but it’s super tiny. It’s just builder basic and needs some serious help. You are inspiring me. Thanks Stacey! This room is really tiny too. That’s why I felt it could carry the bold paper. And yes, I’m one of those people who thinks leopard goes with everything… 😉 This room is just a pedestal sink and the toilet. That’s pretty much it except that tiny little table in the corner. 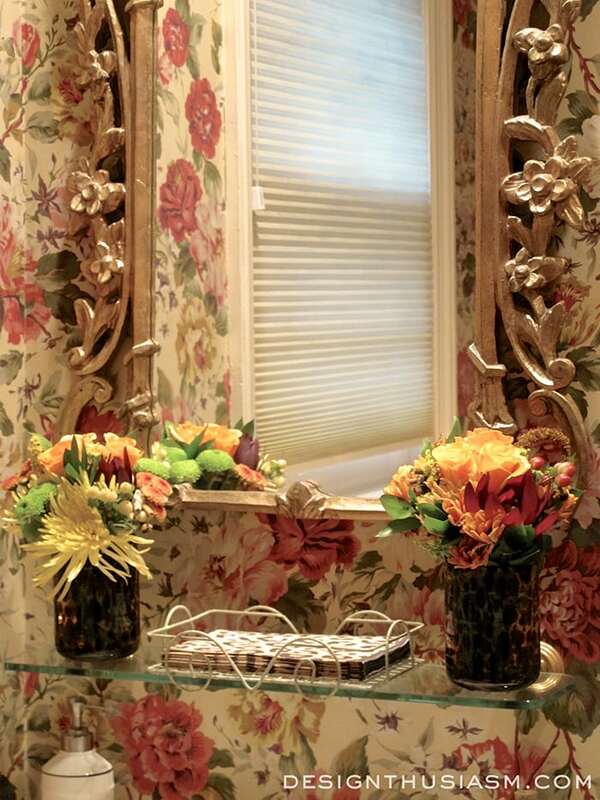 LOVE your powder room! I am drooling at the wallpaper, just beautiful! I am sure your guests will enjoy their ‘visit’!! Thanks Jan! This is why I love bloggers… 😉 I think all my friends think the wallpaper is old-fashioned, but I just love it. I love finding a community of like-minded people! Your powder room is such a lovely space! I agree that it should be treated as the little “jewel box” that it is. Guests will always notice the attention to the details; and enjoy taking in all of the little luxuries! You have done a beautiful job! Your powder room is so to my taste! I love the wallpaper especially. Nice Fall touches. What clever touches for fall! Makes it seem more special! I love those leopard towels, I need some. 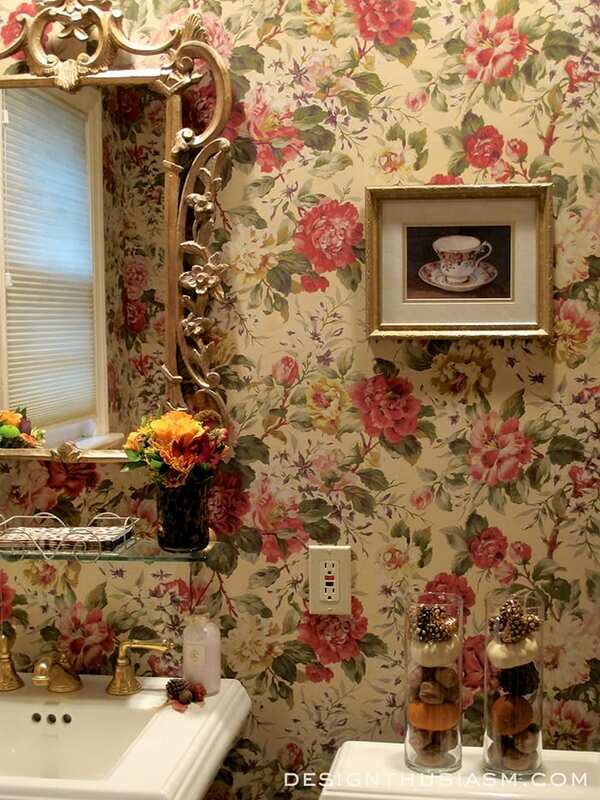 Love this bathroom, so gorgeous and the floral wallpaper is perfect. Your accessories are so lovely. Thanks tons for linking to Inspire Me. 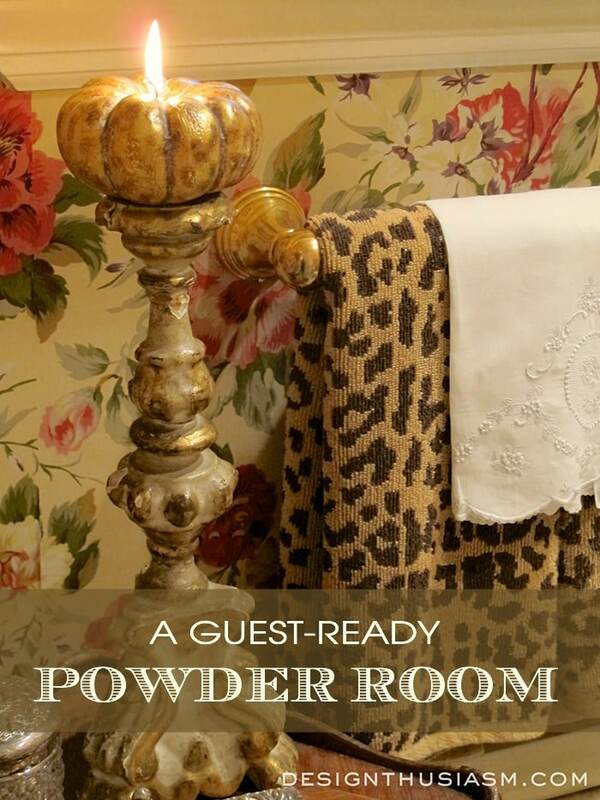 I agree with you a hundred times over, Lori….guests may spend only a few minutes in the powder room, but it has GOT to make a positive, comforting, welcoming impact on them. The powder room is such an intimate space, and what is in there for the comfort of your guests speaks a lot to them about how you feel about their presence in your home. Our powder room on the main floor is relatively small, but there are all sorts of little comfort items in there. I LOVE the wallpaper!!! It really makes a heck of an impression and impact!!! I love Chloe’s comment above about the plunger!!!! SO funny!!! But she makes a very good point…those kinds of things can turn out to be very embarrassing for a guest if they have to come and ask for a plunger or room freshener or additional toilet paper! Great post! Have a terrific week! Ha ha… those are the two things I moved out of the room for the shoot – the plunger and the room freshener… lol! They’re usually in the corner on the floor, but couldn’t find a way to make them look pretty… 😉 This room is really small, so that’s why I felt it could carry such a bold wallpaper. Thanks for the feedback!! I absolutely love your wallpaper! Mixing it with a leopard pattern is perfection. Thank so much, Lisa! I love mixing a little leopard in with everything… 😉 Just adds a little bit of edgy to an otherwise traditional tone. Thanks for visiting! So pretty! I love the pumpkin candle and all the little touches. I haven’t even started decorating for Thanksgiving this year. I have a feeling I will be doing a simple, last minute design scheme. I have been so busy and am so behind. I am looking forward to starting my Christmas decorating though! Thanks Lisa! I just started to do some Christmas today. Just little bits so far… 🙂 But I haven’t even finished my actual family Thanksgiving table. I do so many for shoots that when I get to the real one, I’m past it already… lol! Gorgeous Lory! I too love adding touches of the season in my baths. the only problem you might have with this gorgeous room is that your guests might linger too long. lol! Thanks for sharing with SYC. Wonderful! I love it all! Those silver vanity pieces are gorgeous. 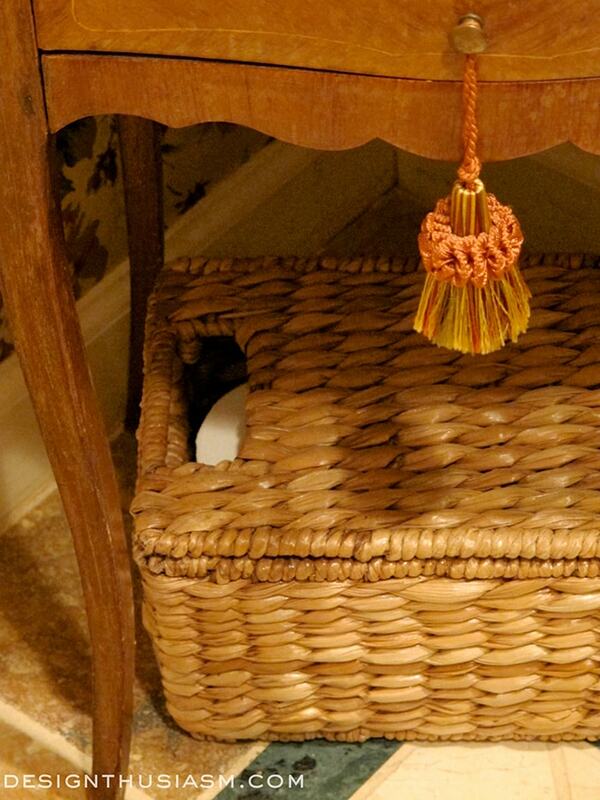 You have inspired me to keep a little basket with the extras, like aspirin & tampons, in my guest bathroom. Thanks for the inspiration. P.s. I love the wallpaper, too. I have been looking for leopard towels for a couple years. Are they recent purchases? Where did you find them? Your powder room is exquisite. Very grown up and classy…timeless. Thanks so much, Pamela! Yes, they are recent – within the past year. They are from Pottery Barn.